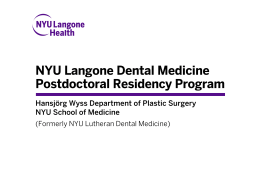 NYU Langone Dental is the largest postdoctoral dental residency program in the U.S.
We Have AEGD Positions Available for 2019. Apply Now! Dr. Tumouh Al-Allaq, AEGD Site Director administered the first invisalign certification course for all NYU Langone residency programs in Maryland. Real World Experience. Real World Advantage. © 2019 NYU Langone Health. All Rights Reserved.